Recently unveiled at Mobile World Congress (MWC) 2018, Nokia 8110 4G (aka “the banana phone”) is reportedly headed to the United States. The Finnish company HMD announced the feature phone will be launched in Europe in May for €89, but hasn't made any statements regarding its US availability so far. However, the same sources that confirmed the Nokia 1, Nokia 7 Plus and Nokia 6 2018 will be launched in the US now say another Nokia-branded handset will be released in the country – the 8110 4G. 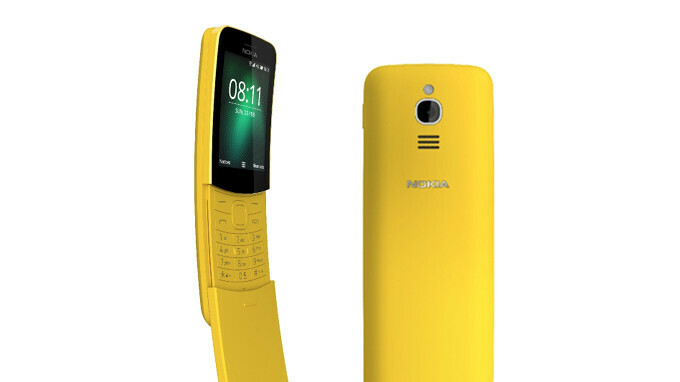 As far as the timeframe goes, it appears that HMD plans to make the banana phone available in the US in May/June. No information about the price has been leaked yet, but the feature phone is likely to cost less than $100. It's also worth mentioning the handset comes in two colors: Black and Yellow. Don't forget to check out our Nokia 8110 4G dedicated page to find out more details about what it has to offer specs-wise. That's mighty weird... The Nokia 1 is also priced around the same price bracket and I think it's a better phone in almost all aspects. Why buy a semi-smart phone when you can buy an almost smart smartphone (Android Go) for just a tad bit more? Oh well... Nokia 1 isn't the bnana phone, is it? Go bananas! G'Day! people will buy the banana phone not because of what it does or the features, but to bring nostalgia to some people. Its very rare to find that kind of phone anymore. I do love nokia but who actually buys these to use? Is it for your children or older people who prefer keys? Some people just want something different from the mainstream. And this device offers that with aplomb. I personally want it because it will last long, and it will stay fast. Unlike android, which after a update might (and probably will slow down... especially on a sub 150$ phone), i dont think KaiOS will, especially considering it's designed to use only about 256 mbs of ram... Not only that but it would be interesting to develop apps for the platform.